WHERE are the James boys and the “Bill” Daltons of yesteryear? What has become of the picturesque train robber who, with a gun in each hand and his eyes boring his victims from above a black silk handkerchief, backed away to his pony, Hung the Wells Fargo pouch of gold across his saddle bow, cut loose with a parting volley of bullets, and galloped off across the prairie trails to lead pursuing posses through nights of hard and fruitless riding? Gone? Not a bit of it! He has changed his game, that’s all. He may have lost his picturesqueness—which any railroad detective will assert he possessed only in fiction—but he has simply turned to new paths in his hopeless struggle against law and order. His pony has been superseded by the automobile. Smooth concrete roads are his prairie trails of today. And his loot is carried away in carload lots by motor truck. For the masked desperado of other days, a gunman still, has gone to robbing freight trains; not that it is less hazardous, but because it holds out a false lure of greater profit. 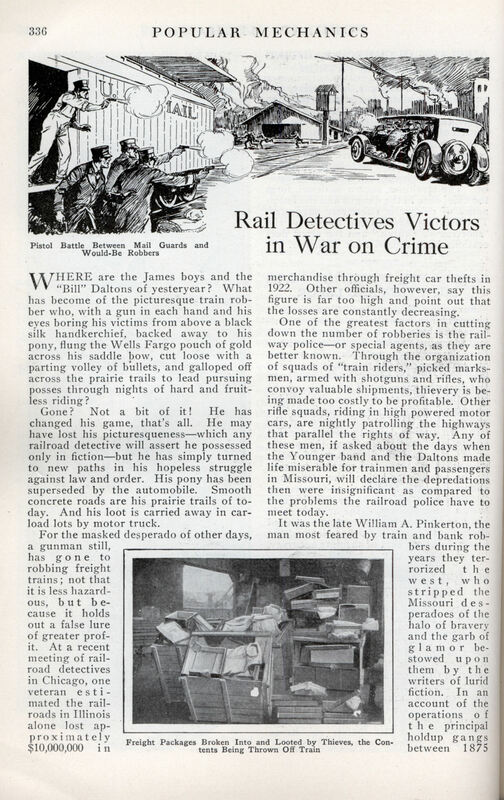 At a recent meeting of railroad detectives in Chicago, one veteran estimated the railroads in Illinois alone lost approximately $10,000,000 i n merchandise through freight car thefts in 1922. Other officials, however, say this figure is far too high and point out that the losses are constantly decreasing. One of the greatest factors in cutting down the number of robberies is the railway police—or special agents, as they are better known. Through the organization of squads of “train riders,” picked marksmen, armed with shotguns and rifles, who convoy valuable shipments, thievery is being made too costly to be profitable. Other rifle squads, riding in high powered motor cars, are nightly patrolling the highways that parallel the rights of way. Any of these men, if asked about the days when the Younger band and the Daltons made life miserable for trainmen and passengers in Missouri, will declare the depredations then were insignificant as compared to the problems the railroad police have to meet today. It was the late William A. Pinkerton, the man most feared by train and bank robbers during the years they terrorized the west, who stripped the Missouri desperadoes of the halo of bravery and the garb of glamor bestowed upon them by the writers of lurid fiction. In an account of the operations of the principal holdup gangs between 1875 and 1907, he pictured them all as a lot of “cowardly assassins,” and so they remain to this day. Just as a crime wave swept along in the wake of the civil war, so the epidemic of train robberies followed the world war, according to the special agents. History repeats itself. At first the thefts were mostly of silk. Then special guards were placed aboard the trains and the number of these robberies declined. One such recent shipment was valued at $12,000,000. It was carried in forty-six cars and accompanied by twenty-five armed guards. Then prohibition came, and the thieves turned their attention to alcohol and liquor. This class of robbery reached the peak in 1920 and 1921. Now all these shipments are heavily guarded until they reach the consignee. Just after the war came a series of mail robberies in which the loot ran into millions. Most of these holdups were committed, however, either after the mail sacks had been thrown from the trains or were being carried to the depots. These thefts became so numerous the war department placed armed marines on all mail trains and also on the postal trucks. There hasn’t been a big mail robbery since. To stop this practice, roads are using shotgun crews in automobiles to patrol the highways near the tracks. Occasionally these squads come upon the thieves in the act of loading their trucks and the battle is on. The train riders usually ride in empty gondolas so they can watch both sides of the cars. Many a running battle over the lurching tops of box cars is fought between them and the thieving gangs, but the public seldom hears of the incident. A few lines in the newspaper announce that John Jones, a railroad detective, was found shot to death in the so-and-so yards, and that’s the end of it. “Talk about the James boys !” exclaimed L. J. Benson, chief of a force of nearly 3,000 detectives employed on the Chicago, Milwaukee & St. Paul system. “Some of these freight thieves have got them beaten forty ways. Get into a pistol argument with some of these birds dodging in and out among freight cars on a dark night and you’ll get all the fun you’re looking for. Another feature of the special agent’s work is the protection of passengers on crack trains from swindlers and gamblers. For instance, a passenger on one of the fast limited trains running between New York and Chicago was approached by a stranger who asked if he played bridge. Responding in the negative, he was informed that but one other member was needed to complete the foursome and that, although bridge was their favorite game, pinochle would be played if he so desired. The passenger refused, but shortly after noticed a young man trailing the inquirer back to a compartment, and later return with a rather discontented look upon his countenance. The two struck up a conversation which ultimately drifted to gambling. Overhearing the conversation, a gentleman, apparently an ordinary business man, joined in the discussion, and later solicited their co-operation in an endeavor to “get the goods 011” the two card sharks who occupied the compartment. 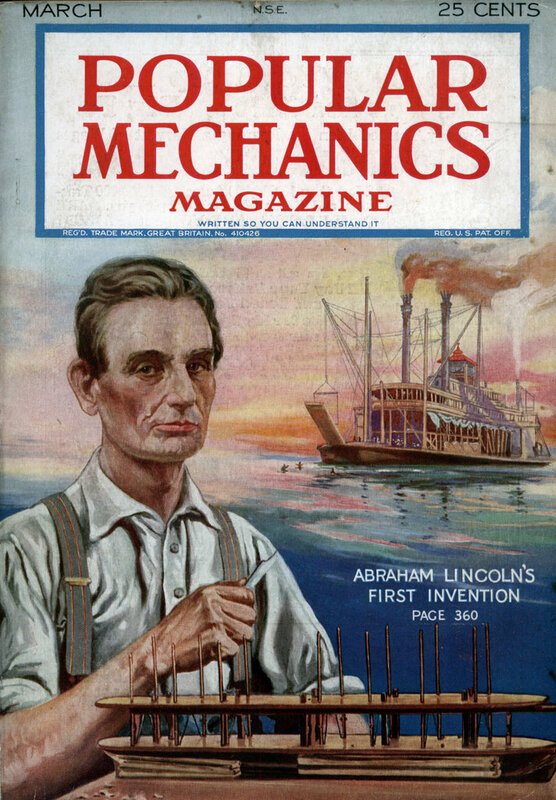 His credentials proved him to be a railroad detective. After dinner the special agent and one of the passengers adjourned to the club car to enjoy a quiet smoke and a social game of cards. It was not long before two men approached, and one, the individual who had extended the invitation to join his party for a game of bridge or pinochle, suggested that they go back to their compartment and have a little game. This invitation was accepted, and as the detective started to shuffle the deck of cards with which he had been playing, one of the strangers suggested, “Let’s get a brand new deck.” He rang the porter’s bell, and in a few minutes the game was on. As it progressed, the bids were raised and the winnings of the gamblers increased. Departing in seemingly good faith, the victims sought the porter. The detective made known his identity, and a rapid succession of questions that form a part of every grilling caused the porter to admit that he had supplied marked cards. The confession was drawn up in writing, signed by the porter, and the two swindlers were arrested at the next stop. Few people realize that they are purchasing personal property insurance, if it may be termed as such, when buying railway tickets. The detectives, however, also act as a guard against pickpockets and wearing apparel thieves. One tells of a passenger who had fastened a highly valued, diamond stickpin on the underside of his necktie which he, in turn, placed in the pocket of his trousers upon retiring. The next morning it was missing and later was recovered from a pawn dealer. Assisting county authorities, the special agents also conduct investigations of the causes of the death or injury of employes, patrons and trespassers and help in the promotion of measures for public safety. In the Chicago district the crossing watchmen on the Pennsylvania railroad help to gather data in a campaign to prevent careless driving by motorists. I guess that was a myth perpetuated by Hollywood? Every time I read or hear “War on…” I cringe. Kosher Ham: More like a pulp novels of the era. Perhaps your’re right, but where does Hollywood take its inspirations from?